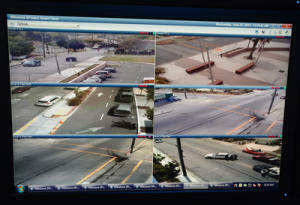 The city already has cameras at two schools and several intersections. In January, the council unanimously agreed to spend nearly $900,000 over three years, money that will help the city place more than 75 percent of its 2.6 square miles under surveillance with either cameras, license plate readers or ShotSpotter audio gunshot detection. Police departments throughout the Bay Area have ramped up use of surveillance cameras and gunshot audio-detection technology. They say it helps deter crime by providing real-time monitoring of areas, as well as record crimes in progress, speed response times, nab suspects and more efficiently deploy resources. 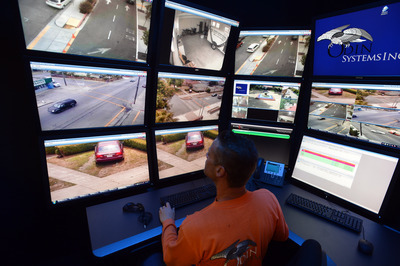 Police in Pittsburg use surveillance cameras that display real-time videos on computers and even officers' smartphones, an innovation that San Pablo has adopted as well. But Schuld says San Pablo's program, in a small city of about 30,000, may become the most comprehensive, which is fine with him. "I don't have a problem with being out in front on this," he said. On a recent visit to the city's police headquarters -- a nondescript building save for the massive antenna jutting from the roof -- Schuld and Lt. David Krastof detailed their plans and shuffled through data sets demonstrating the efficacy of surveillance in modern policing. More than 60 percent of local crime is committed by people coming into San Pablo from the outside, often from high-crime neighborhoods bordering the city, Krastof said. The initial focus is to outfit intersections bordering North Richmond -- such as Market Avenue and Rumrill Boulevard -- with high-resolution fixed cameras, remote-controlled panning and tilting cameras, and automatic license plate readers, which can be aimed by an official at department headquarters. Next is to beef up cameras in the city's Old Town district, which is only three-quarters of a square mile but is where nearly half the city's violent crime occurs. Federal grants helped the city install similar cameras near two local schools, which already have drastically reduced graffiti and captured images that helped solve a homicide, Krastof said. "These tools give a superb level of surveillance," he said. Schuld and Krastof walked downstairs from the chief's second-floor office to the burgeoning surveillance program's nerve center, a small, glass-encased room with 18 active monitors, some segmented into multiple subscreens. Officers on desk duty, cadets and volunteers monitor the screens, and the footage is automatically archived for 90 days in a massive, 7-foot-tall server a few rooms over. Images of familiar local landmarks flash across the screens, including real-time feeds from outside Chico's market and Downer Elementary School. Schuld said once the infrastructure is in place, it will cost only about $75,000 per year to maintain. In some Bay Area cities, the rise in surveillance technology usage has sparked noisy backlash, but none has emerged in San Pablo. "None, no negative reaction at all," Schuld said about public surveillance concerns. "But we have been very careful to emphasize that we respect privacy and use this to enhance public safety in public places. We aren't looking in our residents' backyards." Schuld said the expansion plan has been vetted through the city's Safety Commission, and that camera operators are trained in "what they can and cannot view." Councilman Paul Morris, one of the unanimous votes to expand the program, said he too also not heard any concerns from constituents. "The only people who have something to worry about are the bad guys," Morris said.